December 6, 2018 – Sometime between now and Dec. 21*, when the current appropriation for the Department of Homeland Security will expire, Congress needs to provide the agency with another’s year’s funds. A single word has become a sticking point for the politicians who will vote on that funding: “wall,” as in President Trump’s border wall. The current Senate iteration of the DHS appropriations bill contains $1.6 billion for 65 miles of either border walls or border fences — depending on one’s party affiliation — in the Rio Grande Valley of South Texas. This is an area that received 54 miles of either border wall or border fence in between 2009 and 2010. I live in the Rio Grande Valley, a few miles north of the 2009 border wall and in the vicinity of the new ones: No one here has ever called it a fence. He has also repeatedly said that Democrats have successfully opposed Trump’s “concrete wall” — meaning DHS’s recent prototype barriers erected near San Diego — which is cold comfort for those of us who live in the path of construction that is every bit as damaging. It also ignores the fact that one of the designs set for construction in South Texas is, in fact, full of concrete and steel. But Democratic members of Congress who don’t want to own up to giving Trump his border wall, largely seen as a symbol of racism and xenophobia, still cling to the semantic game in an effort to avoid culpability. Those of us who have been forced to live with border walls know first-hand that whatever name is applied, they inflict tremendous damage. I detailed this damage and the likely harm that new walls would inflict in a recent report for the ACLU and other organizations, which can be read here. I would encourage members of Congress to read it before they vote on border wall funding. The funds approved by Congress last spring will build the levee walls through the National Butterfly Center, Bentsen State Park and World Birding Center, and the Lower Rio Grande Valley National Wildlife Refuge. 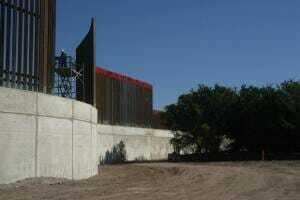 Thirty-foot-tall walls of concrete and steel will cut off worshippers from the historic La Lomita chapel, leading the Diocese of Brownsville to assert that “church property should not be used for the purposes of building a border wall [which] would in fact be a sign contrary to the Church’s mission.” Farmers, some of whom have held property in their families since the 1760s, will lose riverfront land. Bollard border walls will be built in the Rio Grande floodplain, where they will put communities on both sides of the river at risk of worsened flooding, potentially leading to property damage and deaths. And as walls go up, migrants are pushed into more dangerous border crossings, leading to more and more deaths. Calling a 30-foot-tall concrete and steel monstrosity a fence does not change its nature. Those of us who live along the border would at the very least appreciate honesty in Congressional debates. Members of Congress can vote for border walls or they can vote against border walls, but either way, they need to own their vote and its on-the-ground impacts. Semantic games are not appreciated by those of us who will have to live with the consequences. Scott Nicol is the co-author of the recent report Death, Damage, and Failure: Past, Present and Future Impacts of Walls on the U.S.-Mexico Border released by the American Civil Liberties Union and partnering organizations. He lives and teaches in McAllen, Texas. * This piece was updated to reflect the two-week continuing resolution agreed to by Congress on Monday, Dec. 3, which funds the government until Dec. 21.